Ben Glover comes from Glenarm, Co Antrim, a small coastal village 30 miles from Belfast, Northern Ireland and splits him time between there and Nashville, Tennessee, where he recorded his latest album. This new album (his fourth) was originally planned to be a five song EP, but the sessions went so well that more tracks were written and recorded and a full length album created. Ben Glover has toured or performed with artists including Vince Gill, Buddy Miller, Jim Lauderdale, Mary Gauthier, Jason Mraz and Tift Merritt. His songs have been used in feature films such as “Finding Joy,” hit webisode series “Adults Only,” and as the theme song for BBC N.Ireland sports programme "The Championship". In the past year he has toured extensively including dates in Belfast, London, Glasgow, Edinburgh, Dublin, New York, Brussels as well as dates at the famed Hotel Café in Los Angeles and sold out shows in the Nashville’s legendary Bluebird Café. 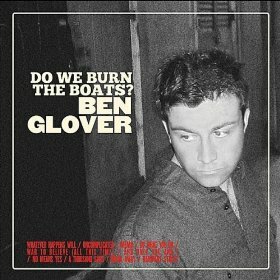 Ben Glover's music is probably best described as a blend of folk and country, but however you choose to describe it, there's one thing thats really clear - "Do we burn the boats" is an excellent album. The songs are fantastic - the music is great and the lyrics are very well written, and the songwriting certainly bears comparison to some of the greats including some of Bruce Springsteen's work. Great songwriting though is only half the story - unless the songs are performed well then they won't work. Happily Ben Glover performs them brilliantly - his vocals are smooth and familiar feeling, and the music is kept simple so that it never distracts away from the lyrics, but instead simply enrich the sound.